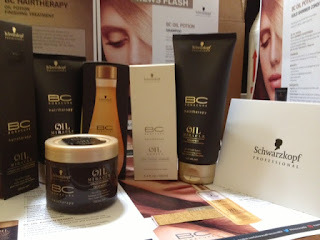 The first day I started with the shampoo (which smells great) and followed up with the Gold Shimmer Conditioner. After that I applied the Gold Shimmer Treatment and left it in for 10 minutes. After a rinse I towel dried and spritzed my hair with the Liquid Oil Conditioner. I was very happy when I woke up the next day and my hair was soft to the touch. After a week of using Schwarzkopf Professional’s products my hair looked and felt healthy and soft. Previously, I had been using Argan Oil on my hair and while it left my hair soft it was also flat. The BC Oil Potion line does contain Argan Oil but it also incorporates other ingredients that aid in the repair of dry hair. I was also happy to see that after using the products my hair actually had body. Now I know why Schwarzkopf Professional is a favorite brand of many hairstylists. The products are great for daily use and you can get salon quality results at home.